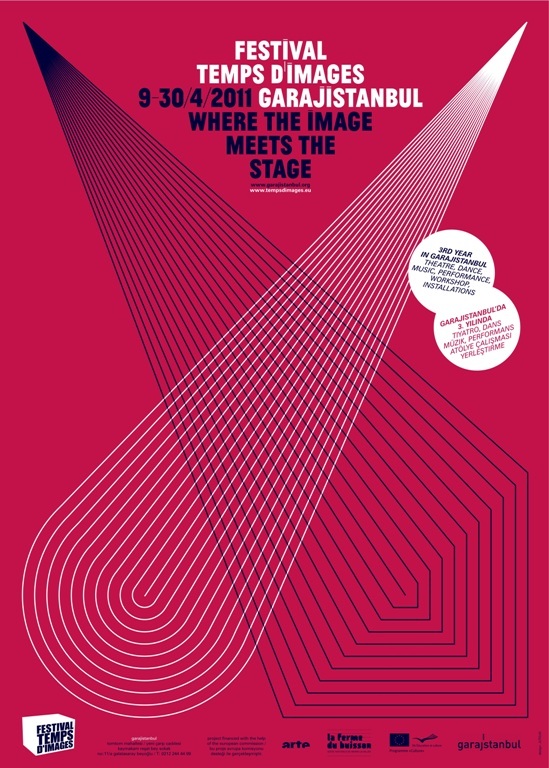 Festival Temps D’images, which will be held between 09 April – 30 April 2011 in garajistanbul for the third time, focuses this year on the interaction between music and visual arts. The program ranges from electro, dubstep, techno and experimental house music to visual art performances, interdisciplinary theater and dance performances, 3‐D video mapping techniques, interactive placements, workshops and seminars about technology and art interaction carried out with Universities in Istanbul. Selcuk Artut and Lanfranco Aceti from Sabanci University will be giving a talk titled ‘About International Symposium on Electronic Art 2011 (ISEA2011)’ in garajistanbul. In this event we will talk about the joint platform of electonic arts with visual and performing arts and discuss the contemporary situation. Founded in the Netherlands in 1990, the Inter‐Society for the Electronic Arts (ISEA) is an international nonprofit organization fostering interdisciplinary academic discourse and exchange among culturally diverse organizations and individuals working with art, science and emerging technologies. 17th International Symposium on Electronic Art (ISEA2011) will be held in Istanbul, Turkey.